Welcome to the Oversoul (Dis)Accomplishments thread! Have you beaten a monster lately? Have you lost when the monster had 1 hp left? Found a cool new character? Anything and everything about Oversoul that makes you proud or extremely grumpy belongs in here! This is not a place for conversations but rather for declaring to the world you accomplishment or dis-accomplishment as the case may be. Here are a few ground rules to set up so that we are all on the same page! If you are experiencing problems, please report them in the Oversoul Bugs Forum. Acc: Bought two gold Shadow Cards. Didn't get anything too special, but now I'll be able to be a bit more defensive then usual. Going to get 40 SG's and hopefully get some better cards for Dire Monk. ACC: One of my Gentlemen Ideas, The SHadowgent, got picked as a coice for voting! Dis : Still failing Drake, Kruger and Alpha Zard. . . and Thrak. ACC: Void Knight level 19!!!!!!!!!!!!!!!!!!!!!!!!!!!!!!!!!!!!! 1.) Pyre Witch 2.) Master Barbarian 3)Blood Ranger 4)Light Guardian 5)Sir Galahad 6)Sword Warrior. ACC: Finally found Ogre Shaman! DIS: Lost to a Treasure Chest o.0 Twice. ACC: Encountered four Stone Golems! ACC: Found Arch Lich on my 3rd try, caught it on my 1st! ACC: Arch Lich is awesome! Level 11 now. DIS: It's the year 2013, I still haven't started playing Oversoul. and got the bottom row of cards for water pack with 4 SGs! ACC: Found Kruger and a Poison Drake! ACC: Started playing again yesterday. DIS: Failed to get Ice Nomad / Ice Apprentice / Frost Void about 15 times. ACC: Found 2 Krugers and 2 Alpha Frostzards, all in a row!! ACC: Hex void level 6. ACC/DIS: Bought a bunch of lightning card packs for my Hex Void. Now i am poor. Cards make it easier to level. 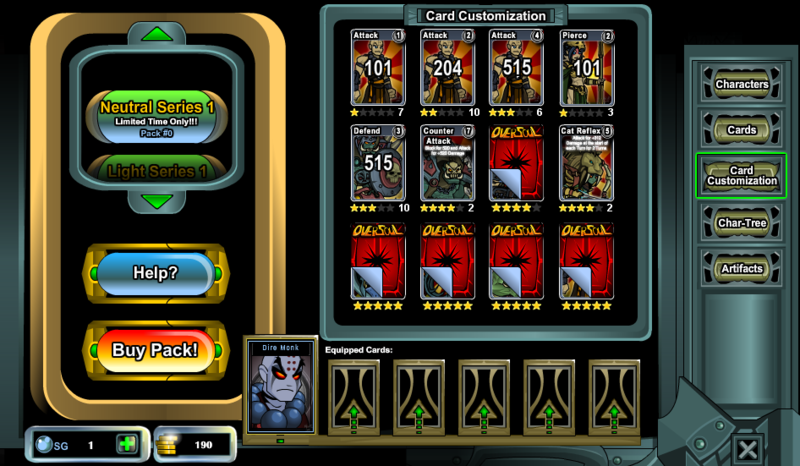 DIS: cant seem to get incinerate for fire cc no matter how many packs I buy..